I was a faithful Star Wars: The Clone Wars viewer for five years, so when they cancelled the show (with an encore season on Netflix) but announced that unproduced episodes would be released in different media, including Dark Horse's Star Wars: Darth Maul: Son of Dathomir, this piqued my interest. Among the strongest material to come out of Clone Wars was when the show had gained enough ground to tell stories without the Jedi and instead devote entire episodes to villains or other long-running plotlines, namely Asajj Ventress, the Nightsisters, Savage Opress, the Mandalorian conflict with Death Watch, and the resurrected Maul. Indeed, if it was sad to see Clone Wars cancelled (though some of that is mitigated now by popular aspects of Clone Wars appearing in Star Wars: Rebels), at least it went out on top. Of the five four-part arcs in Clone Wars, at least four of them were eminently watchable, a ratio where other Clone Wars seasons don't always fare as well. The closing arc with Jedi Padwan Ahsoka Tano is great, but equally well-done is the final Darth Maul story, which also closes out the Mandalore storyline and Obi-Wan Kenobi's romance with Duchess Satine, and marks one of the few times in the show Darth Sidious takes matters into his own hands. Clone Wars may not have always intended to end at this point, but the episodes certainly lend themselves to a satisfactory ending. 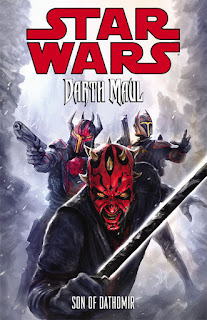 Writer Jeremy Barlow does a fine job of capturing the feel of Clone Wars in Darth Maul: Son of Dathomir, collecting the four-issue series based, again, on unproduced Clone Wars scripts and serving as a sequel to the Season 5 arc. Each episode of Clone Wars, though not always self-contained, ended on something of a pause in the action a la the Star Wars movies; here, too, Barlow avoids the standard comics tropes of sudden cliffhangers at the end of each issue and instead fashions each chapter episodically like Clone Wars. Though the story isn't drawn in Clone Wars style -- which I don't disagree with -- I felt in all cases that the dialogue sounded true to the characters' animated voices, especially Count Dooku and Obi-Wan Kenobi. And I rather liked the sense I had that Son of Dathomir was playing direct to Clone Wars viewers and not a greater universal audience, with references to such inside baseball as the Nightsisters and Mother Talzin, the corrupt Mandalorian prime minister Almec, and Pre Vizsla's darksaber. While enjoyable, in the end Son of Dathomir serves to move the characters around a lot only to put them back almost exactly where Clone Wars left them. It's a story which itself needs a sequel, either as originally planned in a later season of Clone Wars or in another Dark Horse comic -- neither of which, of course, are likely to be the case. What Barlow's story contributes, however, is an exploration of the plans within plans regarding Maul on one side and the Sith on the other. Son of Dathomir posits that each character had a relatively similar plan -- Maul wanted to build his stature to draw out Sidious for Mother Talzin, while Sidious wanted to imprison Maul to draw out Mother Talzin to help him. In Clone Wars's fifth season, Maul's reasons for wanting to build a criminal empire seemed to be just for general "badness," and I liked that Barlow's story adds a layer that the viewer could later intuit behind the scenes in a Clone Wars re-watch. We also learn that Maul is Mother Talzin's son, though some of the drama involved is alluded to, not shown. That part of the story was less effective, and I wondered if perhaps Barlow didn't have the room to give that thread, that the Clone Wars television show or some follow-up story might have. Confusingly (mildly so), I believe Son of Dathomir remains within the new Star Wars continuity, whereas James Luceno's novel Darth Plagueis -- which I believe makes up some of the Talzin/Maul back-story alluded to here -- does not. Again, I didn't mind that Son of Dathomir isn't drawn in classic Clone Wars style. At times, Star Wars comics in Clone Wars style tend to translate as "all-ages," which I increasingly believe Clone Wars itself was not (one example among hundreds is Satine's gruesome and tragic murder). Though Son of Dathomir is not gory, artist Juan Frigeri depicts some background lightsaber decapitations and such, which are right for this story's tone but might not have been appropriate in Clone Wars style. At the same time, some of Frigeri's starships and especially the droids seemed strangely off Clone Wars's model, such to suggest a bit more Clone Wars influence might have been called for. Though I greatly respect Dark Horse Comics's contribution to the Star Wars lore, as I've expressed before I often had trouble surmounting the years-long continuity toward enjoying their Star Wars books. To that end, I'm personally glad Dark Horse could close out their license with Star Wars: Darth Maul: Son of Dathomir, a book that I could get into and that felt like a familiar continuation to me of the Star Wars media that I'd been enjoying. If you find yourself back watching Clone Wars Season 5, Son of Dathomir is worth adding to your experience.